I wrote the following reviews before creating this blog. 1. 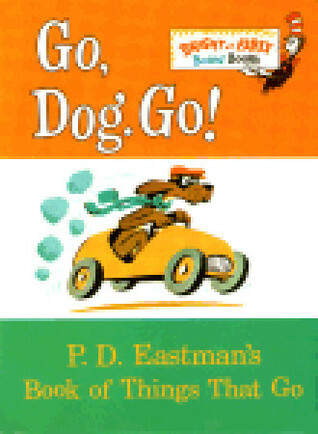 Go, Dog, Go! P.D. Eastman Show me a child who doesn't love this book. Go on, I dare you. And then show me a parent who after the first reading didn't say, "Okaaaay...and what exactly was the point of that book? Of all the random..." But then after a few more readings, show me the same parent who doesn't spontaneously burst out with, "Work, dogs, work!" or "Do you like my hat?" during appropriate, or perhaps inappropriate, points during the day. Obviously, this book has become a much-loved favorite at our house. And I keep asking myself, Why? Is it because there are red dogs and blue dogs, and yes, even green dogs? Is it because the commentary is simple and easy to memorize? Is it the sheer spontaneity of the whole thing (dogs in the water, under houses, on snowy mountaintops)? Or is it because it ends with a totally awesome dog party on top of a tree no less? This is currently one of Maxwell's favorite books. Now that we've read it, you know, close to 100 times, he can jump in whenever he wants, especially on the recurring hat scenes. If you haven't read this book before, then there's no time like the present. Give it a few rereadings before discounting it as complete randomness (and then ask yourself if I could possibly use the word "random" one more time?). Was this book written with Aaron in mind? A regular white sheep is pretty boring. A black sheep, although more rare, is still not anything special. But turn it green, and you need do nothing else to have Aaron hooked. Anyway, this is the perfect read-aloud because the kids can supply almost all the words: Here is the ______ (and they fill in the blank). 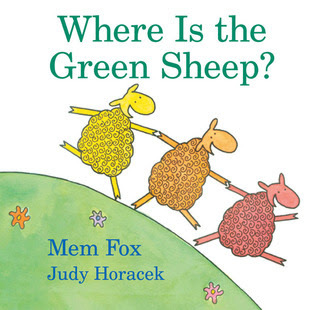 Plus they can act more and more exasperated each time they ask, But where is the green sheep? and no green sheep appears. Really, I feel like this is the epitome of the perfect children's book: simple illustrations, repetitive text, imaginative ideas (what will those sheep do next? ), and a final, happy resolution. I've been so inspired by this book that I just checked out Mem Fox's Reading Magic, which is her book for adults about the benefits and joys that come with reading out loud to your children. I have to get this one in before spring officially arrives and we're thinking about swimming pools, and snow is, mercifully, a thing of the past. If Virginia Lee Burton's The Little House, or even Mike Mulligan, seem a bit text-heavy for your child, you might want to try out this one. 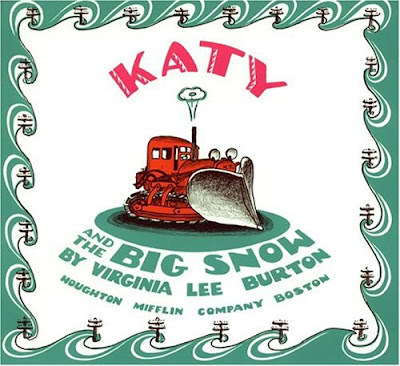 Maybe I've failed to notice the boys' increasing attention spans, but Katy and the Big Snow seemed to have less text per page and hold their interests the whole time. In quick summary, the city of Geopolis gets blasted by a huge snowstorm, and it's up to Katy to quickly plow out the entire city one street at a time so that everyone else can resume their jobs and keep the city functioning. The illustrations are great. The whole city disappears beneath a blanket of snow, and throughout the course of the book, it is gradually uncovered. I always feel like hibernating with a blanket after reading this one. Oh, I was so sad this didn't win the Caldecott this year. Not even an honor! In fact, I was going to devote a whole post to the injustice of it all...but I refrained. 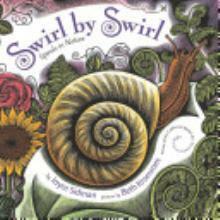 In beautiful wood engravings, the shape of the spiral is explored: roses to tornadoes to animals curled up in dens. We only had to read this one once to love it. What's more, as soon as we were done, we grabbed some paper and markers and drew our own spirals. It's been several months since we read it for the first time, and Aaron is still drawing spirals because of it (and I'm grateful for that because Aaron hasn't really shown much artistic inclination yet...it's one of the few things he will draw). I feel like the mark of a good book is when it inspires the reader beyond the reading. This has the potential to go over the heads of younger readers and to be somewhat boring for older readers, but the illustrations totally make it. They can't help but be pulled in when there's a glistening spiderweb stretched across the page. The illustrations captivated all three of us, and I wish we could read it again for the first time so we could have the fun of turning the page and seeing each picture afresh. I'm always curious with a book like this if the text or the illustrations came first. Because really, in this case, the text is fine, but the illustrations are breathtaking. I have a vague recollection of reading this book over a year ago when Aaron was much younger. I think we read it once. And then promptly returned it. I was horrified by all the bad examples in the book (drawing on the walls, putting toys in the toilet, etc.). Even though each bad example (No No!) was contrasted with a good example (Yes Yes! ), I didn't trust 18-month-old Aaron to choose drawing on the paper when he'd been presented with such a fun, never-thought-of-before alternative. However, now that he is older and has a grasp on choices and consequences, it has actually turned into a very funny book (many thanks to my friend who made me curious to take a second look). And it has led to many fun conversations and laughs. Because it is a board book with very simple drawings and sparse text, it's tempting to disregard it for a three-year-old, but I personally think that is a more appropriate age than anything under two. I've even heard of it being used in preschool/kindergarten classes with rousing success. 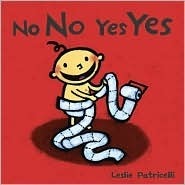 For those of you who have read it, do you think I'm being an overly paranoid parent by banning it from my younger child? Not to be confused with the ever-popular I Spy books, this book is simple enough that Max likes it, but it holds Aaron's interest as well. 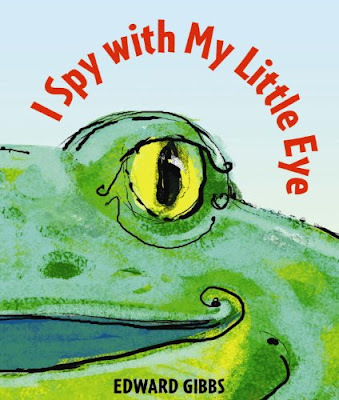 The layout of the book is as follows: one page shows a single eye, belonging to a mystery animal. There is a clue (ex. I am the biggest animal in the world). The eye is a cutout, and when the page is turned, the eye fits into the rest of the animal (a blue whale). The illustrations are captivating, the clues are simple, and it features some of our favorite animals. What's more, the back of the book has a hole in it through which you can spy all sorts of amazing things. I've decided that I really like wordless picture books. I used to be intimidated by them; I didn't want to have to think up what to say to accompany each picture. But now that's part of the fun. Each time I read it, I can focus on something different or find something new. Together with Aaron and Max, we can make the story exactly like we want it. (Oh, and it's also super convenient that if it's time for bed, we can make it short, and if we're waiting for Mike to come home, we can make it long.) Really, wordless picture books are so versatile. In this particular story, a restaurant owner begins the day with his sign loudly proclaiming, Welcome! But then he sees a boy with his dog approaching, and so he quickly erases the sign and writes, No Dogs Allowed. I'm sure you can see where this is going...someone else comes with a cat and then a rabbit, and so he keeps changing his sign to include all the animals that are not allowed. Finally he has shunned so many critters that he has no customers. Luckily, he has a change of heart and comes up with a great solution. 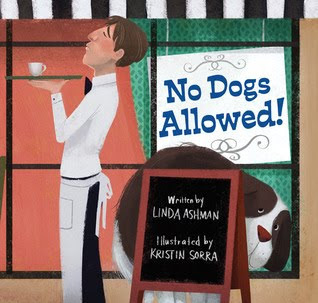 But notice that I've been referring to this as "wordless" picture book, and yet if you look at the book cover, you'll notice that it says "written by Linda Ashman." I've puzzled over this for a good five minutes at least. Does that just mean the idea originated with her? I mean, literally the text consists of a few conversation bubbles with things like "Nooooo!" and "Yes?" in them as well as the changing chalkboard marque. That's it. I guess if you've already established yourself as a children's book author, you don't have to do much to get your name on the cover. Some of these are our favorites, too -- but I hadn't heard of a few. I'm looking forward to reading them with my son. I just discovered your blog and started at the beginning. I 100% agree with what you said about No No Yes Yes!! Why put a "bad" idea into a kid's head before it's already there?? When they're older to understand why there are good choices and bad choices, then yes it would be a fun read.